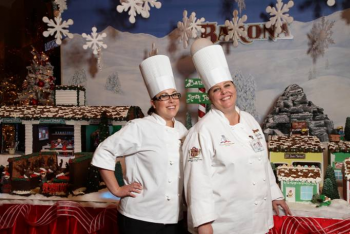 December 11, 2013 (Lakeside) -- Barona Resort & Casino has unveiled a charming gingerbread village called “Barona’s North Pole” which was cooked up by members of Barona’s award-winning culinary team. The village was the creation of Chef de Cuisine Erin DePompeo and Chef de Partie Ashley Rodney with help from Chef Jose Barajas. Measuring 50 feet long, the gingerbread village welcomes guests to Barona’s bustling food court and entrance to the Season’s Fresh Buffet. The team spent more than 900 hours creating the winter wonderland on weekends and before and after their shifts. The buildings, characters and intricate decorations are constructed almost entirely from edible products including butter, cinnamon, sugar, candies, chocolate, cloves, flour, fondant, gelatin molasses and shortening. The village was inspired by Chef Erin and Chef Ashley’s favorite holiday memories. The display features a snow covered village complete with Santa’s Workshop with three rooms including Santa’s private retreat with a roaring fireplace, tiny elves building toys in Santa’s workshop and a gift wrapping room where the elves load up gifts on Santa’s sleigh. Out front there is a miniature Christmas tree lot and a pen where Santa’s reindeer are fed and rest up for the night of delivering gifts to good girls and boys. Other areas of the village include a scene with beloved characters including Rudolph the Red Nose Reindeer, a polar bear plunge, a mine with elves gathering bags of coal for those who have been naughty instead of nice, a train station where an electric train can stop on its way around the display as well as a bakery, shops and even an elf tavern. Barona’s gingerbread village will be on display through December 30, 2013. Barona Resort & Casino, an AAA Four Diamond rated property, is LEED® Gold Certified by the U.S. Green Building Council, Barona features 400 guest rooms and suites all with views of the Barona Valley, a variety of award-winning dining options, the AmBience Day Spa, a full-service events center and the 18-hole championship Barona Creek Golf Club, rated the 3rd best resort course in California by Golfweek magazine. 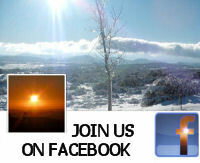 For information, visit www.barona.com.